Shaun Wane, head coach of Rugby League side Wigan Warriors, has joined Scottish Rugby as a High Performance Coach. 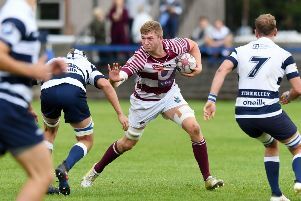 Wane had been tipped to join the Scotland set up last month, and has visited national team training camps in the past, with Gregor Townsend doing likewise at Wigan. He won three Super League Grand Finals with the Riversiders - two as Head Coach - and made over 140 appearances with the Super League side, winning numerous league titles and silverware throughout his playing career. The former Great Britain international will work closely with Scotland’s elite coaches at all levels of the game on a consultancy basis, and will focus on defensive technique and understanding, handling and agility skills for front five forwards. He will also be working closely with players in the BT Sport Scottish Rugby Academy. Wane said: “I see this as a fantastic opportunity to not only impart what I have learnt over my career in rugby league as a player and coach, but also to learn myself from Union and look to support the excellent work already being done in Scotland. “The Scottish way of playing the game is fast, highly skilled and positive and that is something I want to contribute to, and help develop further. Director of Rugby Scott Johnson added: “There is now a well-established practice of sharing information and expertise between league and union and we wanted to add a new dimension to our coaching set-up. Scotland Head Coach Gregor Townsend believes Wane will be able to pass on a lot of knowledge and teaching, adding: “The range of skills now needed across the pitch in rugby union, aligned with the style of play we are developing means that all our players have to be able to pass accurately and deploy effective lines of running that will either hold defenders or find space. Wane will commence working with Scottish Rugby when his commitments with Wigan end.